Thanks so much for stopping by the blog today. I’m January, a life and style blogger residing in the charming and culturally rich city of Baton Rouge, Louisiana. While I was born and raised in New Orleans, Baton Rouge is where I’ve called home for many years now and I honestly can’t imagine living anywhere else. I began my style blogging journey here in 2014 as an outlet for exploring and sharing my love of what I believe to be great style. My love of style and fashion began early on in my preteen years with my first sewing machine (best Christmas gift to date!). This eventually led me to pursue an apparel design degree at Louisiana State University. After a stint in the childrenswear design industry and a couple of other creative ventures, I’ve finally made my way back to my initial love of womenswear fashion. So I guess you could say that I’ve always had a passion for fashion, so to speak. It is my sincere hope that you find some helpful tips/tricks here on the blog that inspire you to feel your very best and it becomes a regular online stop for you. My motto has always been, “Looking good is feeling good”, so let’s get to it, shall we? PS…please feel free to drop me a line if you have a question I can help out with or if you’d just like to say hi! I’d love to hear from you! 225 Magazine | FEB 2017. Out to Lunch Radio Interview with ‘It’s Baton Rouge’ | JAN 6 2017. The Daily Reveille | SEPT 29 2016. In Register Magazine | SEPT 2016. Hi Chelsey! You are too sweet…thank you!! I’d be happy to take a peek at your blog! Thanks so much for your comment! 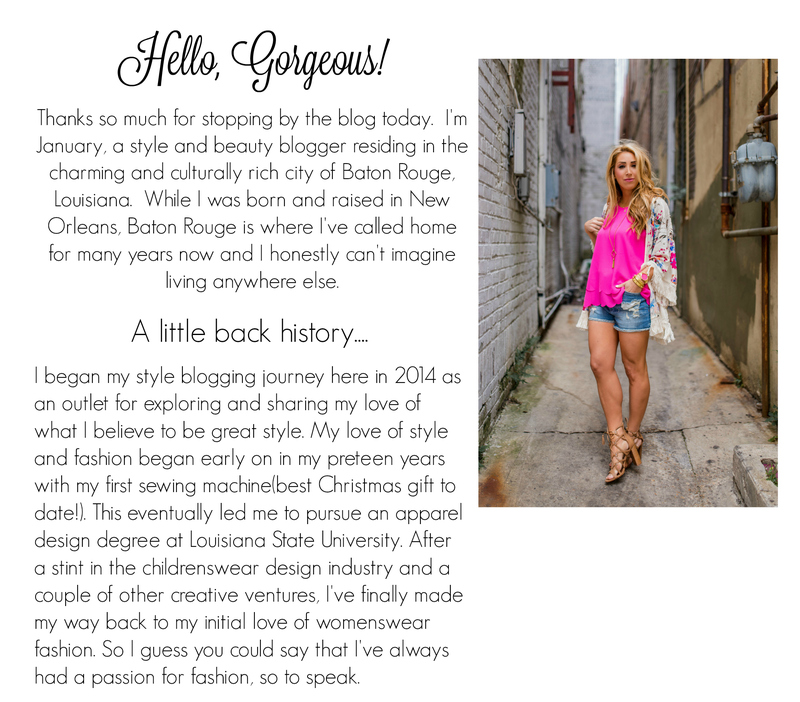 So happy to have found another great Louisiana blogger!